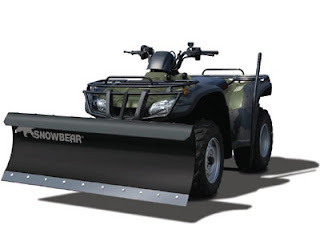 We assembled one of these snowplows on my ATV the other day. My dad and I are the most inept of mechanics, but we persisted. It mounts hanging from an ATV winch, which my machine was not equipped with yet. So I struggled to install one first. I finally succeeded with that project, which had its own challenges. Minor disassembly of the ATV was required, and the instructions were not exactly illuminating. Some of the suggestions for installation were diabolical in feigned innocence. For example, we were supposed to install backing nuts and washers in strategic locations in order to strengthen the assembly. Problem being, the spots were nearly inaccessible. I needed to borrow Mack from next door to put on a couple of the parts. He is a young boy, with much smaller and more adept hands. He was able to succeed where I failed, and the thing was done. After the winch struggle was over, I was facing a pile of snowplow parts scattered across the driveway. It would have looked daunting to a whole man - I was trying this virtually one-handed. It occurred to me to anticipate that these parts would be quite heavy, but I wasn't prepared well enough! Some of the pieces weigh a ton, and it was all I could do just to lift them off the ground. Well, my dad and I decided to put it together in anticipation of impending snowstorms. So we wrestled with it until it looks more or less like the pictures. I assembled and disassembled the latching mechanism for the plow sweep at least four times. I am convinced that I discovered some innovative new ways to put it together wrong. After discovering several ways to assemble the parts in a non-functional manner, we finally discovered the right assembly. It is now ready to challenge the first big snowstorm. My dad and I also discovered an inadvertent talent for comedy. Just give us a job that requires any mechanical handiness. It is simply hilarious. My brother's saying used to be, "Hire the handicapped -- they don't get much work done, but they're so much fun to watch!" We proved that aphorism, several times over. My brother-in-law, Carl, is an engineering professor at BYU. He said he would be glad to help us, and he loves putting gadgets together, but we had already muddled through most of the job when he phoned. Jim, just had to tell you what fun it was to read this post. Loved this line: "Some of the suggestions for installation were diabolical in feigned innocence." It's a long way from those short, typo-speckled, distraught sentences you were pecking out right after the stroke. A vigorous sentence like that one bespeaks increasing health. I'd have to say it's funner to struggle than to get shown up by someone else's incredible skills anyhow. Me and Josh struggled putting together the new baby's crib yesterday. No joke the instructions were 5 pictures, with NO words. For a crib that is supposed to house a human for 2-3 years! I blame whoever is making these instructions for out lack-luster performance. Thanks for your ever-gracious and supportive comment. I have to agree, instructions seem to be written by a gang of idiots, these days. One thing that bothers me is when I get a big fat booklet of installation instructions, and fine that only 5 pages of 200 are actually in english. I guess if I find the english lacking in content, I can always consult the french, german, or spanish version. Another thing that irked me about the instructions is that they contained far more text warning me to be careful about doing something stupid using their product, than they actually devoted to positive instruction. Maybe they know their customers too well. They anticipate that we'll discover every wrong way to do things, before getting it right! You know, there's an easy cure for all of this: move to Texas! There's never any cause for a snow plow here!!! In fact, it's going to be in the low 80s today! Ha! Jim, the county weed supervisor just paid me another visit. Thanks to your arming me with the magic word "Milestone," I was able to avoid some trouble. He said neighbors have been complaining about the knapweed growing in the yard for years and previous property owners haven't done anything, so now we're in the county's sites. He wants to drive his truck into the yard and spray Milestone. I want to comply with county ordinances regarding noxious weeds. But I also have rabbit brush, which I like, sage, which I really like, and a four-wing salt bush which I like and that seems to be kind of rare in the neighborhood, so I value it as a native that has somehow found its way into the yard. We also have globe mallow, which I'm glad for. He said he could avoid the big plants, but this guy thought dandelions growing in the front yard were thistle! When he bent down to touch the leaves he realized he had made a mistake, but I think something's wrong with his vision. Probably, to avoid an official notice and fine, we'll go along with this man's plan to drive into the yard and spray from his truck. I wonder, though, how much damage will occur to the cool plants growing. Much as I would like to say there is nothing to be concerned about, I must confess there is a risk to spraying herbicides around your yard. Maintaining the natural environment is a tricky task. You may have to try and strike some balance between killing the noxious weeds and preserving native species. Milestone herbicide is one of the best alternatives in this application. It has proven to be effective in controlling a selective range of plant species. Mostly knapweed and thistles. Unfortunately, it will certainly affect the other plants as well. I don't know of any practical way to avoid that. One thing I can say that makes the situation favorable is that knapweed tends to grow in bare spots that are fairly devoid of other species. So if you apply it just in areas infested with the knapweed, you should be able to avoid much overspray on other plants. Also, I think the Milestone is most benign for other plants not so susceptible to herbicide toxicity. It is certainly easier on the native plants than just spraying Roundup on everything. I can also tell you that Milestone has proven to have very little biological effect on large animals, and even smaller creatures like soil bacteria and microorganisms. So if you need something that will hurt just the weeds, it stands out as a very good choice. In your situation, I would recommend treating the knapweed to get it under control, then encouraging the native species to recover and fill in the open spaces that will be a result. I am sure you can follow this plan with satisfying results, if you give it a few seasons to work. Thanks for the practical, to-the-point advice. It helped relieve some of my anxiety about spraying such a large area. As soon as the wind dies down, I'll call Mr. Weed Supervisor and get the job done. It might be worth it to you to try and gather seed material from desirable native species. Then, in the springtime, you could attempt to reseed. This is not an easy road to success, unfortunately. Growing from seed is very difficult to get just right. Even agricultural specialists sometimes have trouble. But this is one method to have some assurance that native plants will propagate and establish some ground cover where they have been displaced. Besides, I have the sense that you may prove to be a careful and patient gardener. I told my dad about your comments. We thought it kinder not to remind you that we seldom have to weather a hurricane, here in Utah. So, I won't mention it. Thanks for the note. We love you, and pray for your happiness. Ok, while it's none of my nosey business, if you DID move to Texas, you would, unfortunately, be living in Texas... Enough said. Besides, the house you guys live in is historical and made with the blood sweat and tears of the family, it's priceless in my opinion, and no Texas non-snow would be worth the upheaval!